The advanced Copystar CS 5052ci is a versatile, color MFP that is ideal for workgroups that require intuitive Color and Black and White print, scan, copy, and optional fax capabilities. As a flexible digital imaging hub, the CS 5052ci streamlines business processes, for greater enterprise-wide productivity. From the wide array of innovative features to professional finishing options and leading-edge business applications, the CS 5052ci delivers powerful performance, exceptional usability and proven durability. You built your business to satisfy the mounting demands of today’s professional world. Your office technology should be able to keep up. With Kyocera’s Copystar CS 5052ci, increased productivity is no problem. High quality, high speed printing becomes part of the work routine – and that’s only the beginning. The advanced multifunctional printer is also a copier, scanner, and fax machine. Plus, with its super-modern network compatibility, user-friendly design, and unmatched customizability, the CS 5052ci is a reliable office management solution. Copy, print, scan, and fax all from one convenient, powerful machine. 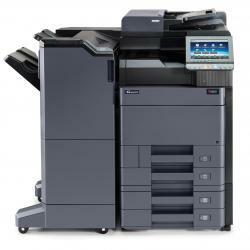 Print in black-and-white and vivid full color at speeds up to 50 pages per minute. Scan up to 180 items per minute, even in color. Optional fax functions combine analog capabilities with updated Internet faxing technology. Compatibility with the latest cloud based technology simplifies and encourages collaboration. Integrate an extensive selection of business applications to fulfill the unique needs of your office. Save money and the environment with resource-conscious construction and consumption. Internal and external finisher options save space, eliminate extra steps, and ensure the job is always done to standard. PDF extensions put nuanced document management and protection at your fingertips.